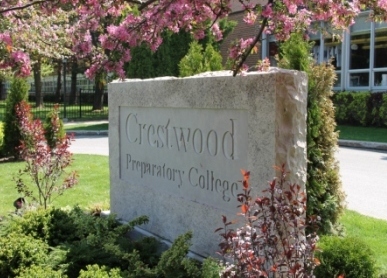 Crestwood Preparatory College is an independent, co-ed, non-denominational university preparatory school. The school and its staff are dedicated to providing quality education to students in grades seven to twelve. Our academic and co-curricular programs are second to none. A fine and professional group of teachers daily offer the encouragement, nurturing and monitoring that produces proud, happy and successful students. Virtually all members of our graduating classes have gone on to university-most to their first choices. Crestwood offers a wide variety of courses – including full music, art, drama and computer programs. All these courses both meet and surpass Ministry of Education guidelines. Our Ministry inspections have always had highly successful and complimentary outcomes. At Crestwood Preparatory College, students are encouraged to achieve to their highest potential, balancing academic, physical and social pursuits within a structured and disciplined environment. We are committed to academic excellence, while fostering integrity, creativity and responsibility to self and community. We educate adolescents to develop positive personal relationships, to embrace differences of appearance and opinion, to underline daily the importance of civility and the sensitivities required to achieve it, and to grasp the necessity of diligence in realizing one’s goals. Crestwood is a proud member of the Conference of Independent Schools of Ontario, a highly reputable and successful private school organization representing forty schools in the province and dedicated to maintaining excellence in all aspects of its member schools.